Randy Kaplan, a government affairs specialist from New York, never leaves home without a baseball. For 18 years he’s kept the balls handy for his growing collection of baseballs signed by world leaders and heads of state. He’s a lifelong collector — beginning with baseball cards and comic books as a kid — but it wasn’t until he met former President George H.W. Bush at a baseball game in 1993 that his life changed forever. But meeting the President was different. A challenge. Gaining access to such high-profile leaders was not so easy to come by, he said. Fast-forward to the Hall of Fame in Cooperstown in 1996, where Kaplan found himself awe-struck by an exhibit featuring a collection of baseballs thrown by American Presidents. 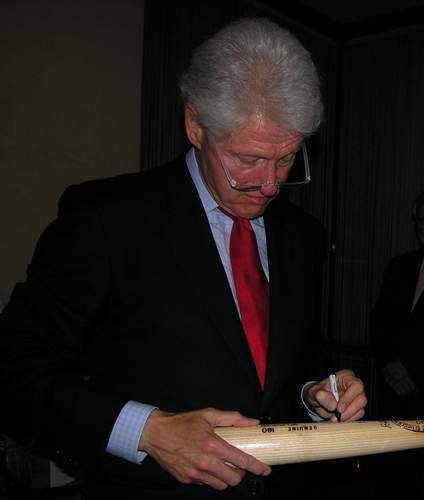 Inspired, he decided he would start his own, except the baseballs would be signed by world leaders. Over the years, Kaplan has collected signatures from some of the most influential people in the world — sometimes in person, other times through mutual friends and networking. He has amassed a collection nearing 200 signed baseballs — 181 of which will be featured at the Herbert Hoover Presidential Library and Museum in West Branch starting Saturday. The exhibit runs through March 22. The one-of-a-kind collection includes signatures from past and present world leaders and heads of state, such as the late South African President Nelson Mandela, former Soviet leader Mikhail Gorbachev, former British Prime Minister Margaret Thatcher, former President Bill Clinton, President Barack Obama, and Indian Prime Minister Narendra Modi. The collection is the largest of its kind in the world and the list of leaders continues to grow. The “Signature of Baseball” exhibit will showcase Kaplan’s collection as well as other baseball memorabilia from the Hoover collection: tickets, medals, and baseballs, including one signed by Babe Ruth and another by the New York Yankees and Herbert Hoover himself. There will be a timeline of the Cedar Rapids’ Kernels’ history and an interactive feature with a simulated baseball field. “Hoover loved baseball … he would be honored to have the collection,” said Melanie Wier, the museum’s assistant curator. She said the exhibit will be especially interesting for collectors and baseball fanatics, but will have something to offer for everyone. Kaplan said he dreams of seeing his collection in presidential museums across the country, the New York Visitors center, and ideally, he said, the Hall of Fame in Cooperstown. “I want to be able to share this with the world,” he said.